Building administrators, faculty, staff, bus drivers and parents all pitched in to show our youngest Bulldogs the ropes as kindergarten officially got underway at the Olmsted Falls Early Childhood Center last week. Parents and students attended one of the several orientation sessions offered together in advance of the itty bitty Bulldogs stepping out on their own on Friday for the first official day of kindergarten. There was no shortage of friendly faces and helping hands along the way as students learned how to get from the buses to their classrooms. This year marks the start of the fourth year of operation for the District’s Early Childhood Center (ECC) dedicated exclusively to the education of our preschool and kindergarten students. 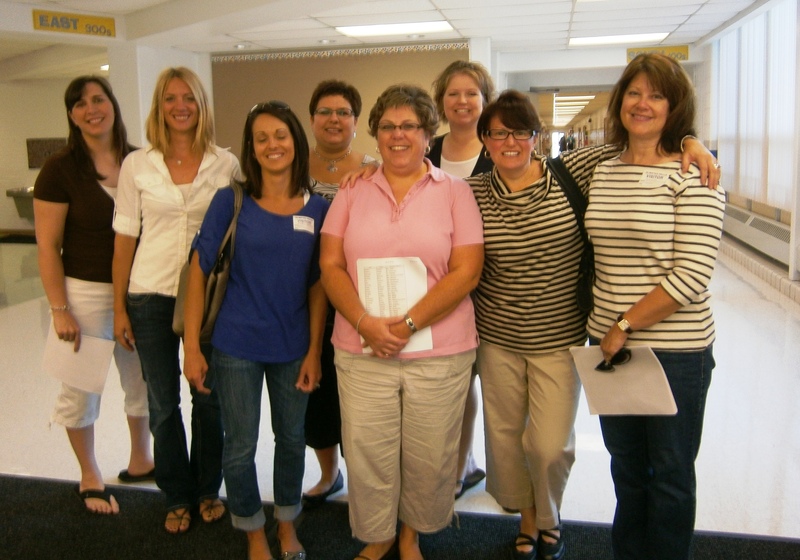 Kudos and sincere thanks to the many parent volunteers who were on hand to help out the first day! Please click HERE for photos from the ECC. Hot off the presses! The 2012-2013 PTA Activity Calendar was sent home (one per household) beginning late last week. PTA Calendars are sent home annually with the youngest student in each household. If you did not receive a calendar, please e-mail kpetrina@ofcs.net with the name, grade and homeroom of your youngest student; OR pick one up from any school building’s main office. Please consider the $2 donation to PTA Council, which can be sent in using the donation envelope attached to each calendar. These donations help fund college scholarships for Olmsted Falls High School students each year. Also, PLEASE NOTE that the August 2013 page of the calendar (for next August) contained incorrect dates. For your convenience, a corrected August 2013 calendar page was inserted into all calendars. If you need to download a replacement copy of the August 2013 calendar page, please click here. Additionally, please make note that “Kindergarten Screening for 2013-2014 School Year” will take place May 1 & 2, 2013. These dates are listed correctly in this year’s calendar; however a duplicate set of Kindergarten Screening dates were erroneously included in the printed calendar on April 2 & 3, 2013. There are no Kindergarten Screening dates in April 2013; please mark your calendar accordingly. Members of the OFHS varsity football team and marching band were the first to play on the newly renovated football field, following the installation of additional field drainage/irrigation and the conversion from a native soil based field to a sand based field finished off with the laying of fresh Kentucky Blue Grass sod that took place over the summer. 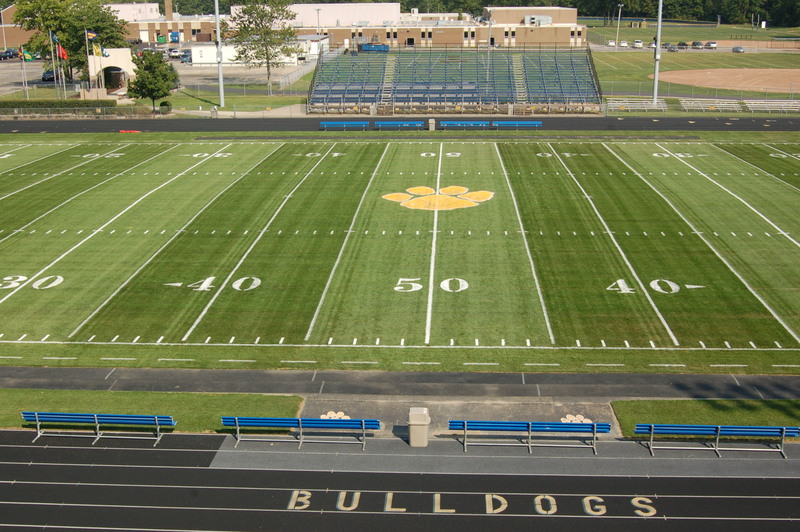 Improvements to the field were made possible through funds from the Permanent Improvement Levy, passed last November. Funds from this new P.I. are making possible a long list of much-needed improvement projects at Olmsted Falls High School and across the District. Upgrades to high school science labs were completed for the start of the new school year, and significant renovations to the high school auditorium will be completed in September. To view the photos of the recent football field renovations, please click here. Congratulations! 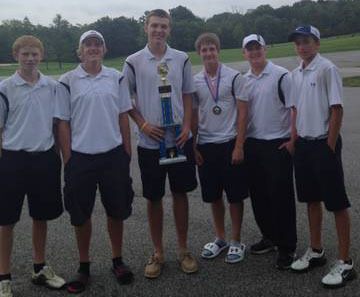 The OFHS JV boys golf team were champions of The Kenston Invitational Golf Tournament at Punderson State Park last week. The boys were first out of 16 teams competing, and beat second place Mentor by 15 shots. Pictured (from L to R) are Cam Winkel, Nick Kay, Alex Mitchell, Brian Jones, Ryan Bratsch and Will Eyssen. 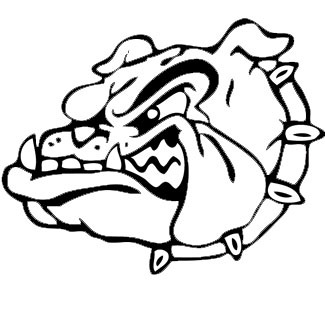 On Saturday, August 18th the Bulldog football team, along with the trainers and coaches, “kicked-off” their season with a picnic celebrating their hard work over the summer. During the last three weeks, the boys prepared for the upcoming season in the grueling heat with two-a-day practices. The Football Moms organized the event by preparing hot dogs and hamburgers cooked by the dads of the senior players to celebrate the team’s hard work. The team had a great time and enjoyed all the wonderful food, though the desserts were the first to go! Sandy Friedrich and Kathy Gib want to thank everyone who donated and helped work the picnic to make it such a great event. The Bulldogs are looking forward to a great season! For more photos of the picnic, please click HERE. 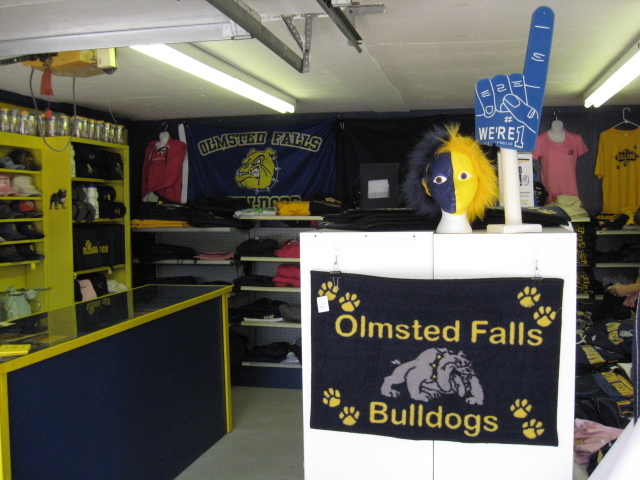 Please support your athletic department by buying official bulldog sportswear from the Olmsted Falls Athletic Boosters. All money raised goes directly to support the sports that we have come to love. Sportswear purchased from other stores supports their own pockets and brings nothing back to the athletes. Please support the Athletic Boosters at home events. To view photos of the Athletic Boosters Team Shop, click HERE. MEET 4TH GRADE TEACHER MRS. JUDSON! 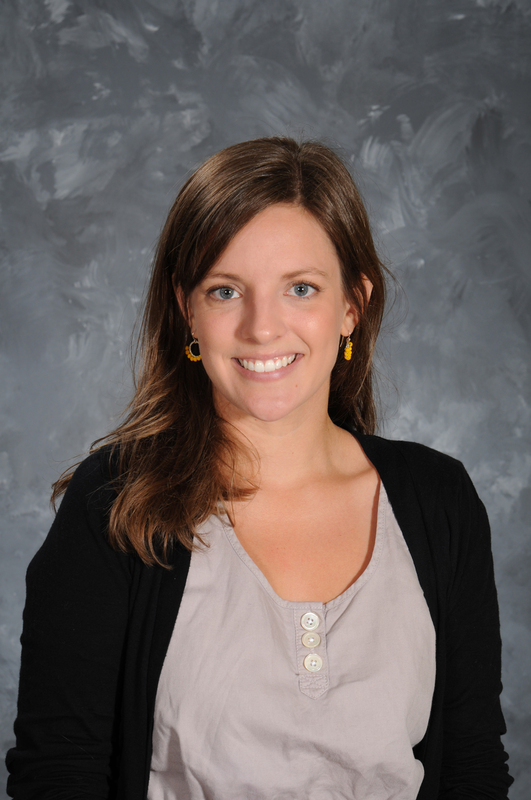 Mrs. Kelly Judson has been teaching for the past seven years, and is currently teaching fourth grade Language Arts and Math at OFIS. She finds great joy in reading novels with her students, and loves making math a really fun place where everyone can be successful! Mrs. Judson’s favorite thing about being a Bulldog is the students. She believes so many of her students are hardworking, kind, responsible, and interested in improving. Mrs. Judson has wanted to be a teacher ever since coming home from school on her first day of 1st grade in Mrs. Atkinson’s class! To her, teaching is the most rewarding and challenging career that she can ever imagine. In her spare time, Mrs. Judson loves to spend time with her family, read, and work on her new home. Mrs. Judson and her husband, a 5th grade teacher at OFIS, would also like to announce that they are expecting their first baby this spring! 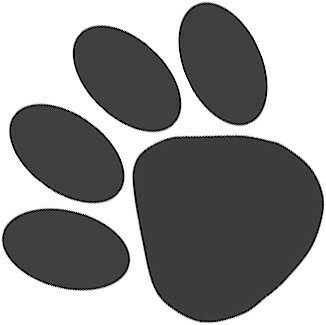 5th Grade Open House – TONIGHT, Wednesday, August 29th @ 7:00 p.m.
Falls-Lenox Open House for SOUTH Learning Community – Thursday, August 30th @ 7:00 p.m.
OFHS Open House – Thursday, August 30th @ 7:00 p.m.
OFHS Science Teacher Lisa Whitney has lots of new observations to share following a summer of conservation work and education abroad. 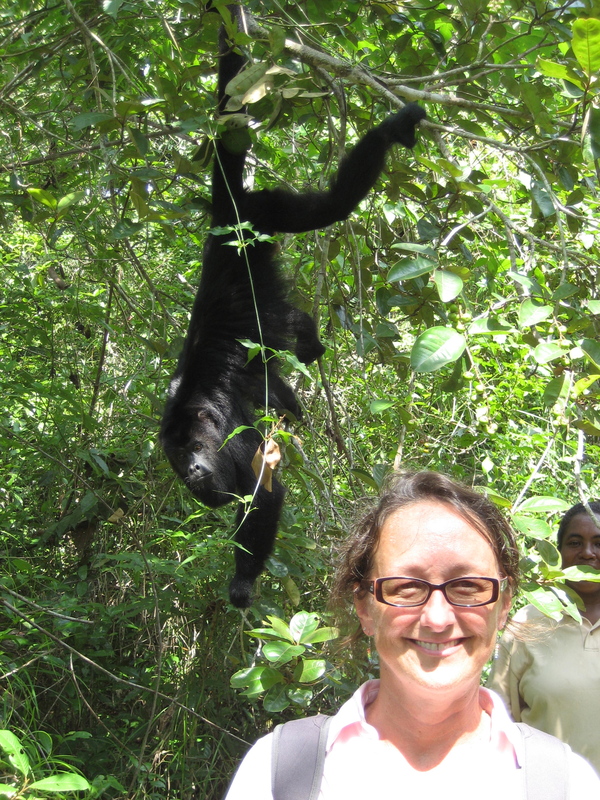 Pictured at left is Mrs. Whitney at the Howler Monkey Community Sanctuary in Belize, where she joined the organization’s efforts to work with the community to preserve the howler monkey habitat. Mrs. Whitney also worked with a Manatee Sanctuary, visited a Smithsonian Research Lab, and studied the Great Barrier Reef! Nonprofit work and outdoor education runs in the family. Mrs. Whitney’s daughter Hannah (OFHS Class of 2012) spent 17 days on remote Fijan islands this summer, teaching lessons to children in the villages. Hannah is a freshman at Miami of Ohio this year. DON’T FORGET TO PURCHASE YOUR BULLDOG SPIRIT WEAR!!!! Olmsted Falls Middle School PTA spirit wear will be sold at the 5th, 7th and 8th grade Open Houses. We will be sending home order forms this week with our Kindergarten through 5th graders. This year we are taking orders for our hooded sweatshirts, t-shirts and pajama bottoms. All orders received by Sept 10th will be filled and sent home with the child on September 28th. All orders received after Sept 10th will be available for pick up at the Middle School on November 5th and 15th. The 2011-2012 yearbooks have arrived! Anyone who did not pre-order one can purchase one now! They are $60 and checks can be made payable to OFHS. They can be purchased at lunches during the day in the pit and at the football games on Friday night by the concession stands. You can contact John Gaba at the e-mail address jgaba@ofcs.net or the number (440) 427-5060. Get them while there’s still some left! The Olmsted Falls Early Childhood Center hosted members of the Olmsted Chamber of Commerce for the organizations first lunch meeting following the summer break. Members relived their own school days by going through the ECC’s cafeteria line to gather their lunch of bbq chicken, salad, watermelon and fresh cobbler, which they then enjoyed on picnic tables in the outdoor courtyard. ECC Director Mrs. Melinda Brunner provided the group with an overview of ECC operations. Following their regular meeting agenda, Chamber members joined Superintendent Dr. Todd Hoadley for a tour of the ECC, which houses the District’s preschool and kindergarten programs. Olmsted Falls High School is looking for families interested in hosting a high school international exchange student this school year. Council on International Educational Exchange (CIEE) Local Coordinator, John Church, is working with OFHS Principal Holly Schafer, to enroll at least one international student. All that’s needed is a host family. Host families can have children of any age or no children at all. They can be two parent families, single parent families or empty nesters. All that is required is a loving and accepting home. Host families learn about a different culture and have the opportunity to share their own. Host families enjoy having a new member of their family, and gaining a special connection to another culture for life. Students are proficient in English and arrive with insurance and spending money. Interested families can find additional information at http://ciee.org/highschool/or by contacting John Church at 440-808-8507, 440-376-7757 or jacbvo@gmail.com. 9th ANNUAL OLMSTED SCHOLARSHIP FUND GOLF OUTING SPONSORED BY THE OLMSTED CHAMBER OF COMMERCE – TODAY, THURSDAY, AUGUST 30TH AT CREEKWOOD GOLF COURSE IN COLUMBIA STATION – 9:00 a.m. Shotgun Tee-off, Scramble Format. Four hole-in-one contests including $10,000 cash grand prize for hole #4. $80.00 includes golf registration, box lunch, BBQ ribs & chicken dinner. Dinner will be served at 2:00 pm. Register on line at www.olmstedchamber.org. If interested in purchasing dinner only for $25.00 or lunch only for $7.00, or for more information, please contact Cindy Kelly at cindy.kelly@remax.net. CLEVELAND CROPS SCHADY ROAD FARM RIBBON CUTTING CEREMONY – THURSDAY, SEPTEMBER 6TH – 2:00 p.m. Join us as we celebrate the opening of Cuyahoga County’s newest farm. Learn how this unique collaboration will lead to15 jobs for individuals with developmental disabilities. Parking at SWINGS-N-THINGS, 8501 Stearns Road with shuttle bus to the farm located at 27180 Schady Road. The Farmers Market is onsite Wednesday’s 3:00 p.m. – 7:00 p.m. and Saturday’s 9:00 a.m. – 2:00 p.m. To view and print the flyer, please click HERE. 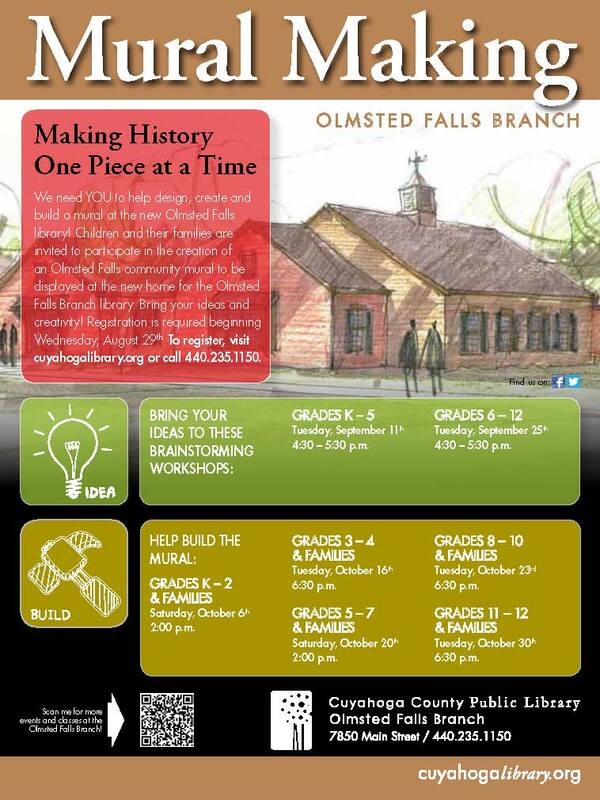 OLMSTED FALLS LIBRARY HOSTS SERIES OF EVENTS/PROGRAMS THIS FALL – Our local library has a great series of events scheduled for this fall. Please click here to access the latest fall schedule from Cuyahoga County Public Library. Thank you to all of our Bulldog staff, students and parents for today’s great start to the 2012-2013 school year! Volunteers and staff working together are the key to first day success! 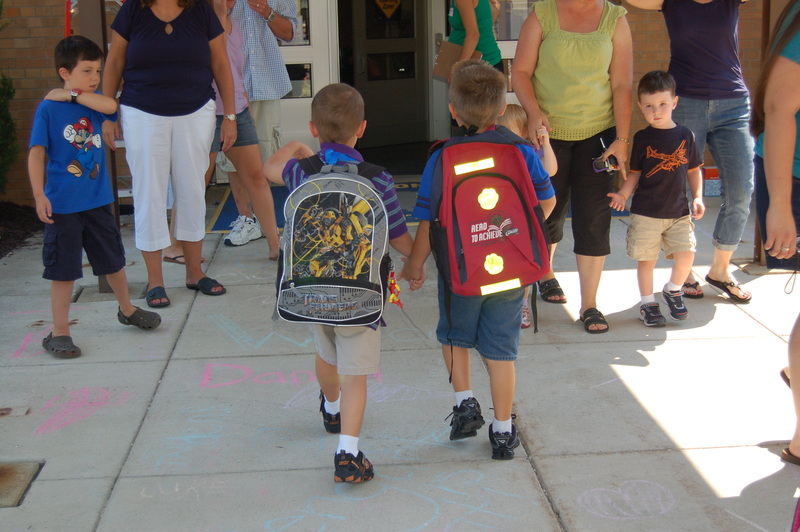 Please click here for some first day photos from Falls-Lenox Primary School. Many thanks to OFHS students who helped brighten up District signage with a fresh coat of paint earlier this week! 4th Grade Open House – Tomorrow – Thursday, August 23rd @ 7:00 p.m.
Falls-Lenox Open House for WEST Learning Community – Monday, August 27th@ 7:00 p.m.
Falls-Lenox Open House for EAST Learning Community – Tuesday, August 28th @ 7:00 p.m.
5th Grade Open House – Wednesday, August 29th @ 7:00 p.m.
District officials recognized employees for their years of service to the District during the annual General Staff Meeting held Tuesday, August 21st. Employees with 1, 5, 10, 15, 20, 25 and 35 “Bulldog years” were acknowledged for their contributions to the District’s success. Congratulations to all and thank you for your service! 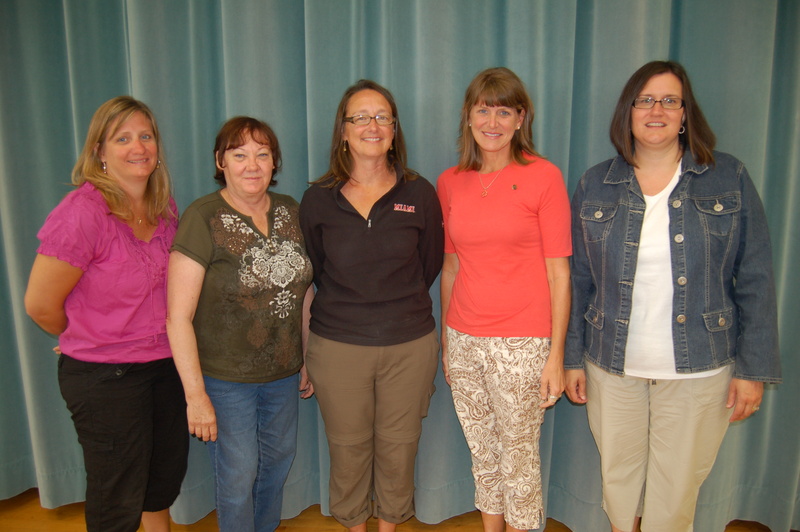 “20 Year Bulldogs” Karen Gommel (Falls-Lenox), Gale Novak (Falls-Lenox), Jill Saracina (Middle School), Sharon Stanczak (Intermediate) and Lisa Whitney (High School); not pictured is Pamela O’Conke (Transportation). “25 Year Bulldogs” Debra Gordon (Transportation) and Mike Paul (Middle School); not pictured is John Holzworth (Intermediate). Seventy-eight eighth graders served as WEB leaders for the Where Everyone Belongs program put on for incoming sixth graders. WEB leaders applied and were selected to participate at the end of last year. Each went through two days of special WEB training last week. 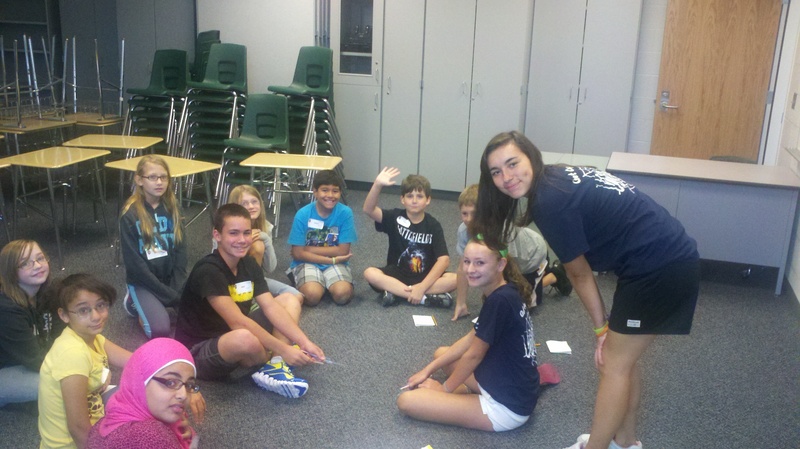 The WEB Orientation Program was held August 20th with more than 350 sixth graders attending. (Click here for photos!) The day began with an assembly in the Middle School gym, which included activities with the new sixth graders and the WEB leaders. WEB leaders also took groups of 6th graders to individual classrooms for activities to help get to know each other, challenge teamwork skills and provide advice on being successful in the Middle School. 6th graders also received building tours from WEB Leaders and had an opportunity to find their lockers. The next big WEB activity will be the BBQ and home varsity football game September 21st. 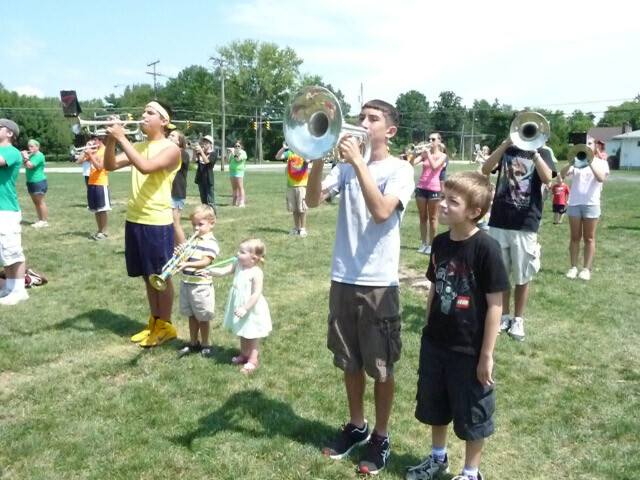 Preschoolers and younger siblings of OFHS Marching Band members participated in a special “march with the Bulldog band” event last week. A select group of band members demonstrated their instruments for the group. The “Pride of Olmsted Falls” then marched onto the field playing the fight song! Kids got to pick which student or instrument they wanted to stand by before the alma mater was played. They can’t wait to see their new friends take the field this Friday night! Thanks to the OFHS Marching Band for the memorable experience! For more photos, please click here. MEET SECOND GRADE TEACHER, MRS. KEMPER! 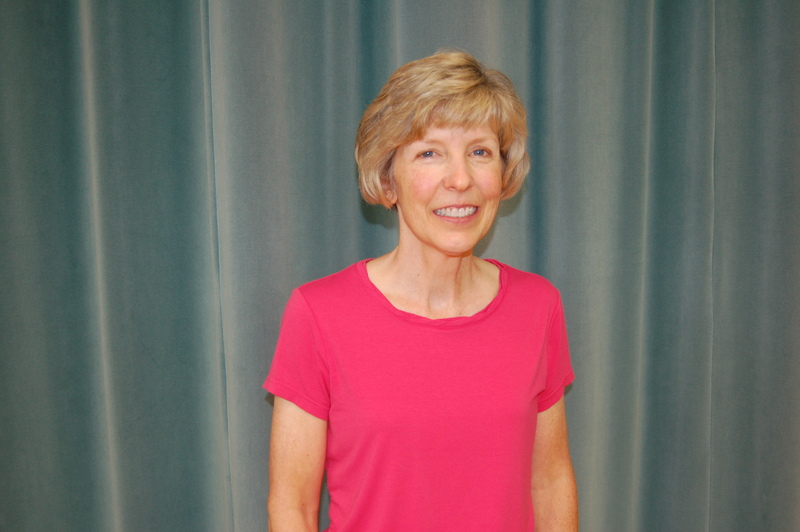 Mrs. Julie Kemper has been teaching second grade at Falls Lenox for the past eight years. She loves being a Bulldog because she believes that the Bulldog community works together for what is best for our children, and does their best to give them a great education in a wonderful learning environment. 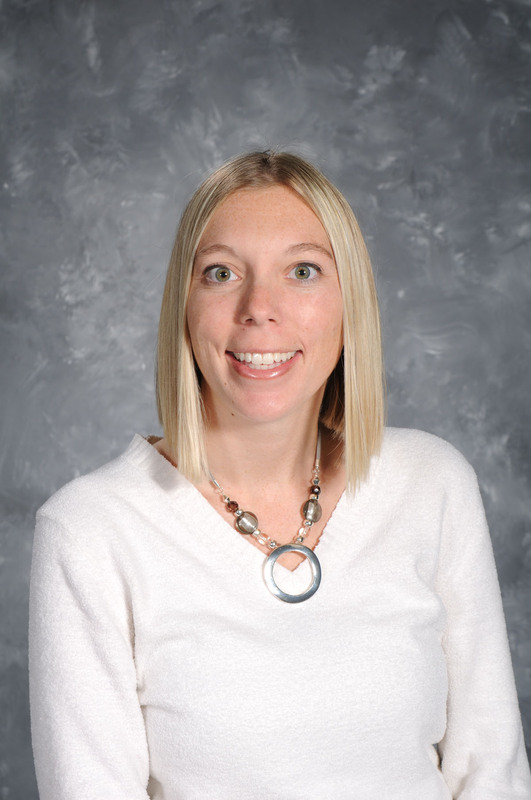 Mrs. Kemper decided on a career in education because she loves working with children and wants to help them succeed. She especially enjoys watching the faces of her students when they feel proud of themselves or have achieved their goals. Mrs. Kemper and her husband have two children, Lia (3), and Hayden (4 months). In the little bit of spare time that she does have, she enjoy traveling, hiking, and relaxing! 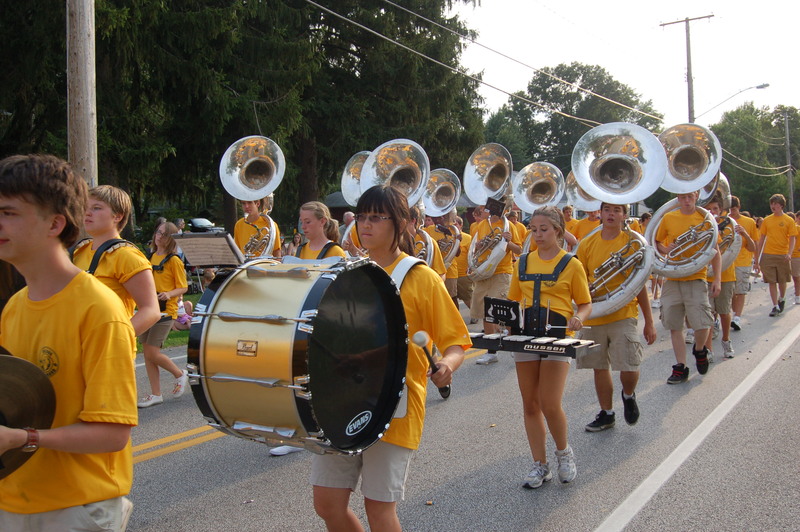 In the annual tradition, Olmsted Falls Board of Education members and District administrators joined the OFHS Marching Band, Bulldog athletes and mascot on the parade route in the Heritage Days Parade held August 16th. Students, families and community members lined the streets for the annual event…and for the candy. Please click here to view our Heritage Parade photo gallery. Please join us in welcoming Ann Stricklen (left) to the District’s Personnel Department and Kelly Mendeluk (right) to the Treasurer’s Office. OLMSTED FALLS SOCCER REC LEAGUE – REGISTRATION EXTENDED TO THIS SATURDAY, AUGUST 25TH This is a reminder that is not too late to register your child for the Olmsted Falls Soccer REC league. We have extended the soccer registration until August 25nd. You can register online and the fee is $70.00 for the session. Our web site is http://olmstedsoccer.wordpress.com/. The players will practice one night during the week with a game on Saturday between 9:00 – 1:00. Please see the web site for practice times and days. The first game will be September 8th and practices start the week after Labor Day. 9th ANNUAL OLMSTED SCHOLARSHIP FUND GOLF OUTING SPONSORED BY THE OLMSTED CHAMBER OF COMMERCE – SATURDAY, AUGUST 30TH AT CREEKWOOD GOLF COURSE IN COLUMBIA STATION – 9:00 a.m. Shotgun Tee-off, Scramble Format. Four hole-in-one contests including $10,000 cash grand prize for hole #4. $80.00 includes golf registration, box lunch, BBQ ribs & chicken dinner. Dinner will be served at 2:00 pm. Register on line at www.olmstedchamber.org. If interested in purchasing dinner only for $25.00 or lunch only for $7.00, or for more information, please contact Cindy Kelly at cindy.kelly@remax.net. 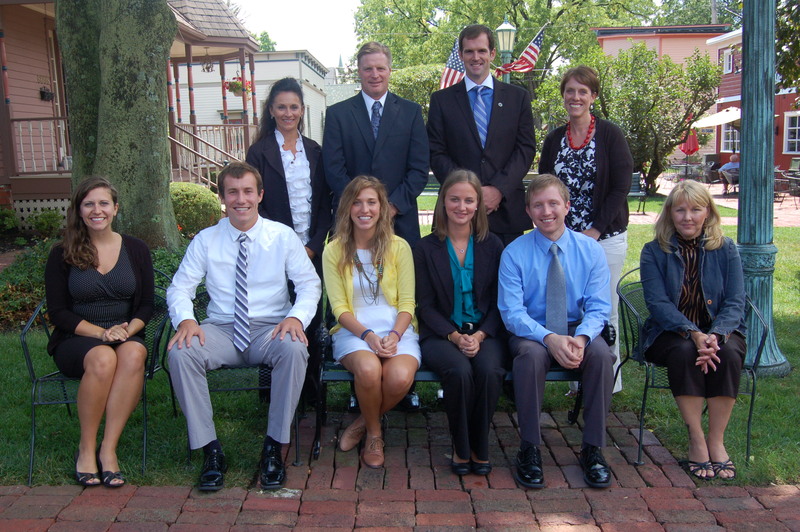 Pictured, Back Row (L to R): OFHS Principal Holly Schafer, OFHS Asst. Principal Sean Wolanin, OFHS Dean of Students Sean Baker and OFHS Counselor Maridi Gurtsak. Pictured, Front Row (L to R): OFHS Language Arts teacher Hannah Sparks, OFHS Tutor Jim Brabenec, OFMS Intervention Specialist Christen Hawks, OFMS Spanish teacher Laura Ulmenstine, OFMS Language Arts/Science teacher Eric Bartkowski and ECC Preschool teacher Suzanne Kramer. Be sure to read next week’s blog to meet more new Bulldog staff members! Be sure to check out the freshly painted concession stand at the OFHS stadium! 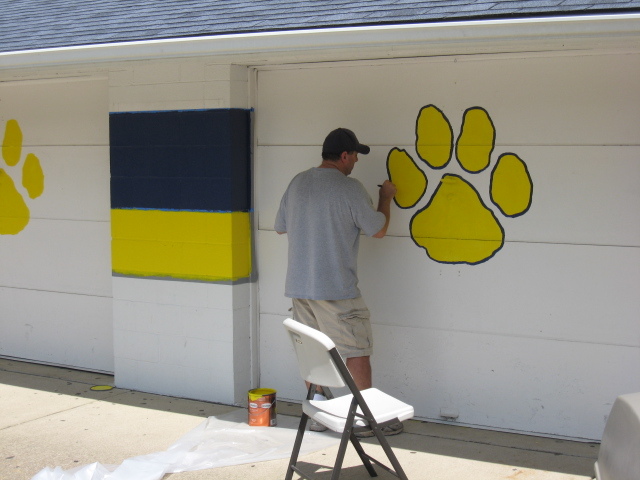 Volunteers from the Olmsted Falls Athletic Boosters recently got together to give the stand a new look, which of course, exudes Bulldog pride! Special thanks to Jim Souris, Loula Souris, Rich Zivcsak, Rich Shennemen, Jim Polcar, Karen Polcar, Dave Kurz, Wendy Yako and Jim Baldwin for their time, effort and creativity! For more pictures of the new concession stand and the paint job in action, please CLICK HERE. Students helping students was the name of the game today at Olmsted Falls High School as student ambassador assisted fellow Bulldog students stopping in to pick up their schedules for the 2012-2013 school year. Students in grades 10-12 came in throughout the day. Reminder to All Fall Athletes: Tomorrow is picture day! In the event of inclement weather, pictures will be taken in the High School’s Main Gym. Make sure your athlete arrives 10 minutes early for their picture time. For schedule of team photo times, please CLICK HERE. MEET OFHS MATH TEACHER MR. TODD BOWERS! 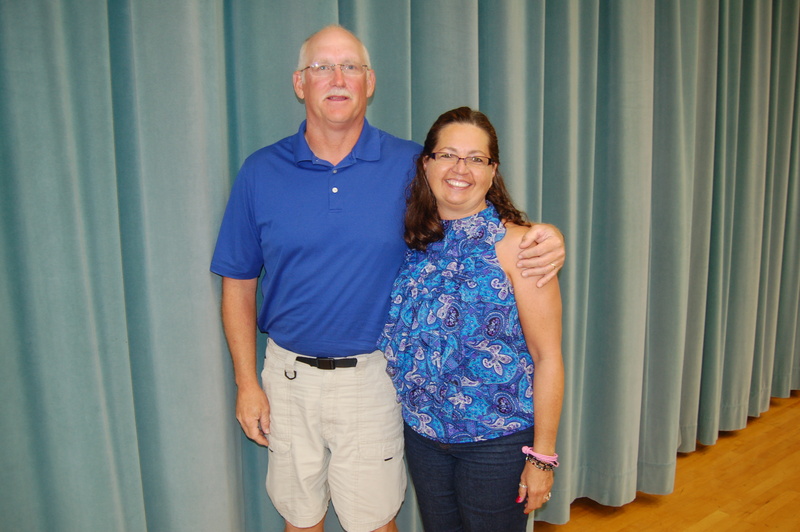 Mr. Todd Bowers is entering his 25th year of in Olmsted Falls, and will teach Alegebra 2 and Geometry at OFHS this year. Mr. Bowers has held numerous coaching positions over the years and currently serves as the Assistant Athletic Director at OFHS. Mr. Bowers became a teacher because he learned valuable information and life lessons from his own teachers. He enjoys passing on knowledge to his own students, and has been a good role model for them throughout his career. 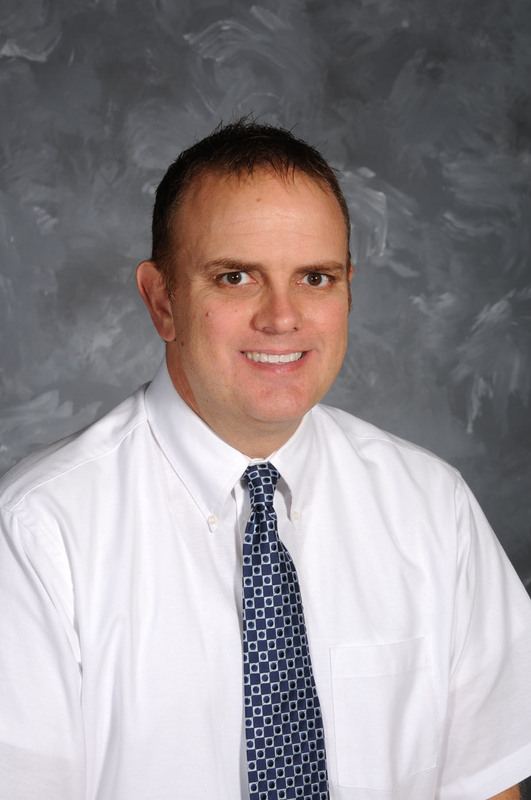 Mr. Bowers loves being a Bulldog because of the outstanding cooperation and support he has witnessed over the years from fellow teachers, administrators, staff members, parents, students, coaches, and community members. 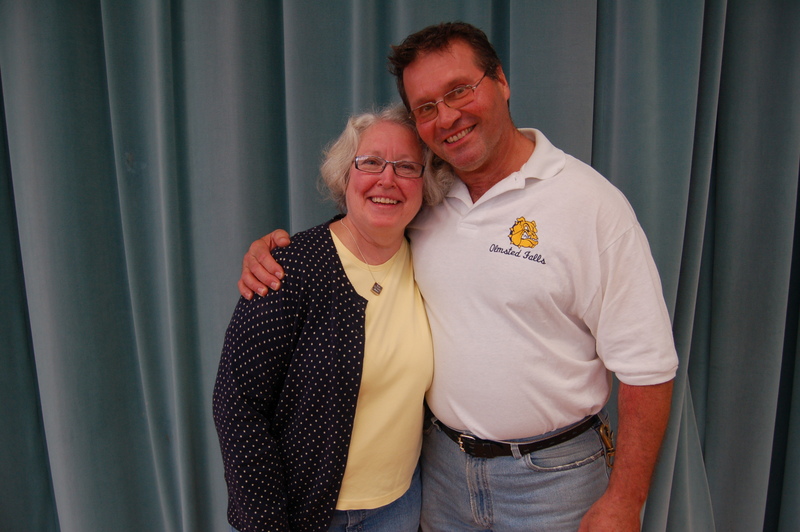 He believes Olmsted Falls is truly a place where everyone works together to educate our students. Mr. Bowers lives in Olmsted Falls with wife Lisa, and two daughters, Annalise, a junior at OFHS, and Audra, a 7th grader at OFMS. He enjoys playing golf, reading, watching sporting events, coaching Audra’s summer softball, and watching his daughters dance recital performances. *Note: Supply lists are not provided in advance for students at OFHS. 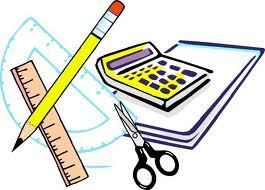 Individual teachers will advise students as to what supplies/materials are needed for each course. Over the summer, Olmsted Falls School District transitioned to a new student data system using Pearson Power School software. Parents accustomed to accessing their student’s assignments, grades, attendance information, etc. 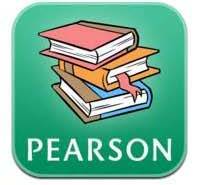 via Progress Book (for grades 4-12) will now begin using Pearson’s Power School with the current 2012-2013 school year. User ID and password information will be provided in a letter from respective building principals at the beginning of the year. Parents will find Power School very similar to Progress Book in terms of the student information available, and will now be able to monitor school fees within the system as well. Please watch for the important letters regarding the new Pearson Power School system. Note: User ID and password information will be provided separately for each individual student. As with Progress Book, parents will have the ability to merge multiple student accounts into a single account with one user ID and password. Effective August 1, 2012, Olmsted Falls School District will no longer utilize on-site credit card machines for the payment of school fees and school meal accounts. The removal of the credit card terminals from all school buildings is a cost-saving measure for the District. School offices will no longer have the capacity to process credit card payments in the office or over the phone. Parents choosing to pay school fees with cash or a check can continue to do so by visiting the respective school office. HERITAGE DAY PARADE – TOMORROW THURSDAY, AUGUST 16th – 6:30 p.m. – Don’t miss this annual community event! Parade will step off from Falls-Lenox School and follow traditional route. Don’t forget your candy bags! OLMSTED FALLS SOCCER REC LEAGUE – REGISTRATION EXTENDED TO AUGUST 25TH This is a reminder that is not too late to register your child for theOlmsted Falls Soccer REC league. We have extended the soccer registration until August 25nd. You can register online and the fee is $70.00 for the session. Our web site is http://olmstedsoccer.wordpress.com/. The players will practice one night during the week with a game on Saturday between 9:00 – 1:00. Please see the web site for practice times and days. The first game will be September 8th and practices start the week after Labor Day. We hope that everyone is enjoying the summer break. 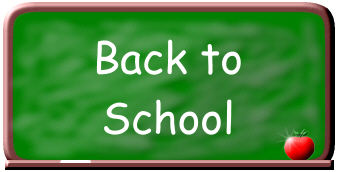 With just two weeks left before the start of the new school year, we are officially activating our District’s weekly blog in order to provide you with a summary of important back-to-school information. 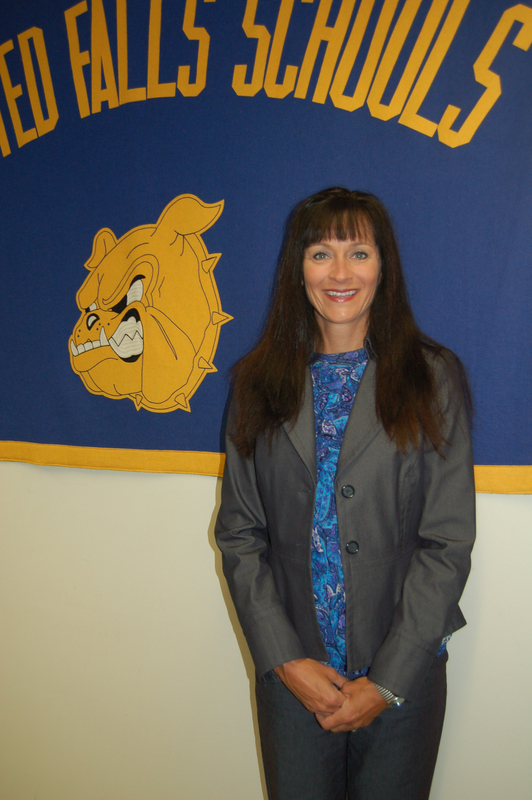 Help us give a warm Bulldog welcome to new Olmsted Falls High School Principal Mrs. Holly Schafer! Parents and students are invited to stop by the High School office anytime between 5-7 p.m. this Tuesday, August 14to meet Mrs. Schafer . To read the article about Principal Schafer, which appears in the latest issue of Our School Report, please click here. The Olmsted Falls High School Post Prom Committee will be having its first meeting of the year for anyone interested in helping plan this annual fun-filled evening for OFHS seniors. Interested parents are invited to attend the kick-off meeting on Wednesday, August 15 at 7:30 at East River Park. Be ready to discuss themes, fundraising ideas, committees, and ways to make this event a success. Olmsted Falls High School’s Student Council is distributing barely-used school supplies it collected from last year. Students from ALL grade levels, K-12, are invited to browse the collection this Monday, August 13th from 9 AM – 1 PM. 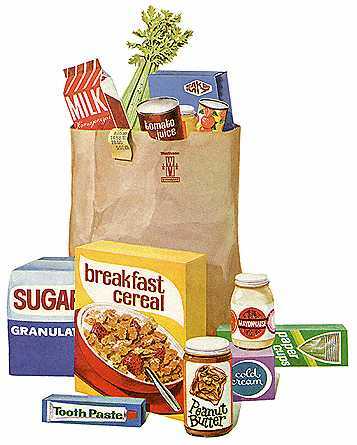 In order stretch the supply to benefit as many families as possible, the group is asking that a maximum of three items per student be taken. There are notebooks, folders, paper, binders, locker stands, and many other miscellaneous supplies available – most of which are in above average condition. Students and parents can look through, and select from, this supply on Monday, August 13th, from 9 AM – 1 PM, in Room G26 at the high school. Please e-mail OFHS Student Council Advisor Mr. Tom Gibeaut at tgibeaut@ofcs.net with any questions. Mrs. Kim Urban is a 6th grade Math and English teacher at OFMS, and also serves as an assistant varsity volleyball coach, as well as a 7th grade basketball coach. Entering her 15th year of teaching in Olmsted Falls, Mrs. Urban is a Bulldog alumnus who has wanted to be a teacher since the first grade. She believes being a teacher allows her to help students access and understand material they have previously not known. She also enjoys learning from her students! 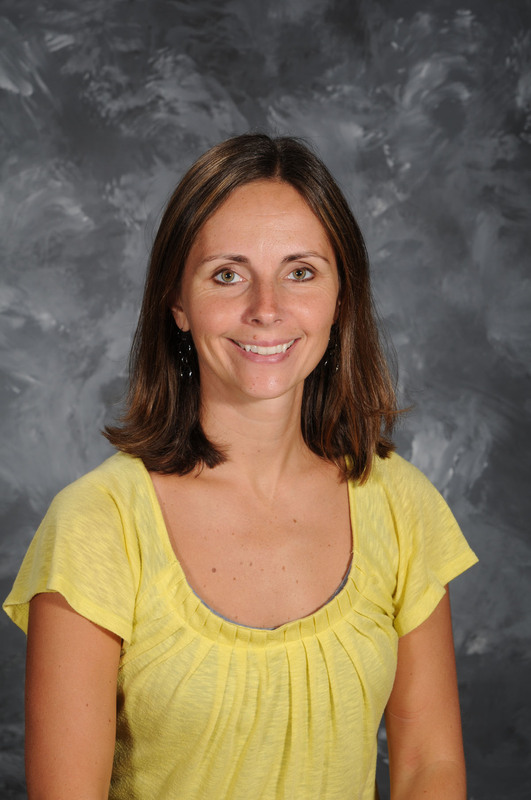 Mrs. Urban loves being a being a Bulldog because of the relationships that she has built –both during her school days in Olmsted Falls as well as during her professional years. She believes that true Bulldogs are loyal and takes pride in that loyalty. In her spare time, Mrs. Urban enjoys watching her children Tyler (10) and Kylee (7) participate in athletics. She also likes reading, playing volleyball, and yoga. Please click here to download a copy of the 2012-2013 Academic Year Calendar for Olmsted Falls Schools. HERITAGE DAY PARADE – NEXT THURSDAY, AUGUST 16th – 6:30 p.m. – Don’t miss this annual community event! Parade will step off from Falls-Lenox School and follow traditional route. Don’t forget your candy bags!